Definition at line 1631 of file lscript_tree.h. Definition at line 1634 of file lscript_tree.h. Definition at line 1646 of file lscript_tree.h. 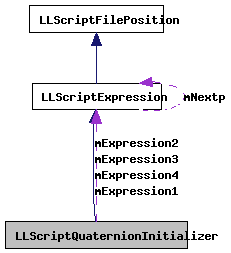 Definition at line 6711 of file lscript_tree.cpp. 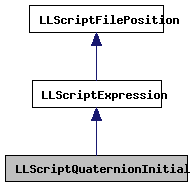 Definition at line 6574 of file lscript_tree.cpp. References LLScriptByteCodeChunk::addByte(), gErrorToText, LLScriptGenerateErrorText::getErrors(), LLScriptExpression::gonext(), legal_assignment(), LOPC_CAST, LSCP_EMIT_ASSEMBLY, LSCP_EMIT_CIL_ASSEMBLY, LSCP_PRETTY_PRINT, LSCP_TO_STACK, LSCP_TYPE, LSCRIPTOpCodes, LSCRIPTTypeByte, LSCRIPTTypeHi4Bits, LSCRIPTTypeNames, LSERROR_TYPE_MISMATCH, LST_FLOATINGPOINT, LST_QUATERNION, mExpression1, mExpression2, mExpression3, mExpression4, LLScriptExpression::mNextp, LLScriptExpression::mReturnType, NULL, print_cil_cast(), LLScriptExpression::recurse(), and LLScriptGenerateErrorText::writeError(). Definition at line 1653 of file lscript_tree.h. Definition at line 1654 of file lscript_tree.h. Definition at line 1655 of file lscript_tree.h. Definition at line 1656 of file lscript_tree.h.